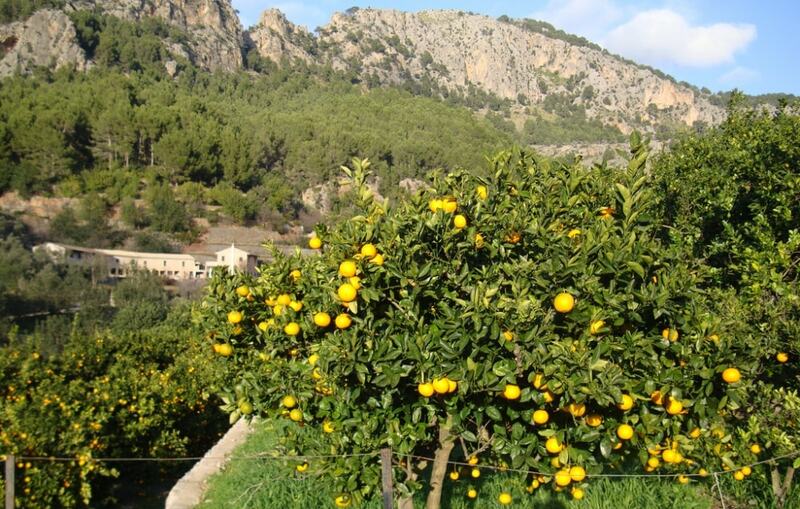 The authentic town of Sóller is lying in a beautiful valley, where plantations of orange trees and other citrus fruits abound. It has a unique character, charm, a feeling of community and services that make it an enjoyable place for all-year-round living. Soller Town property market selection extends from modern apartments to townhouses built in Art Nouveau style. Also, in the countryside, you find stone-built fincas, boasting tranquility and fine views of both the valley and the sea. In comparison to the most expensive part of the region, Port Soller, prices in the town are lower. The average price for an apartment for sale on Soller Town property market is Average price per sqm. in Soller €3,022 0% properties#: 73 last change on: 19 Apr 2019 €3,022 per square meter and the price of a house hovers around Average price per sqm. 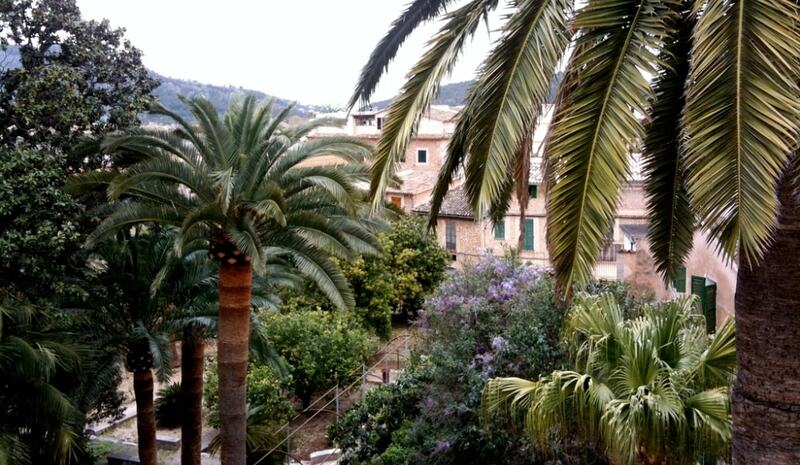 in Soller €3,709 -1% properties#: 254 last change on: 19 Apr 2019 €3,709 per square meter. Interestingly, privileged sea view position raises the average price for a property here. If you’re looking to invest, you’ll find opportunities here for Average price per sqm. 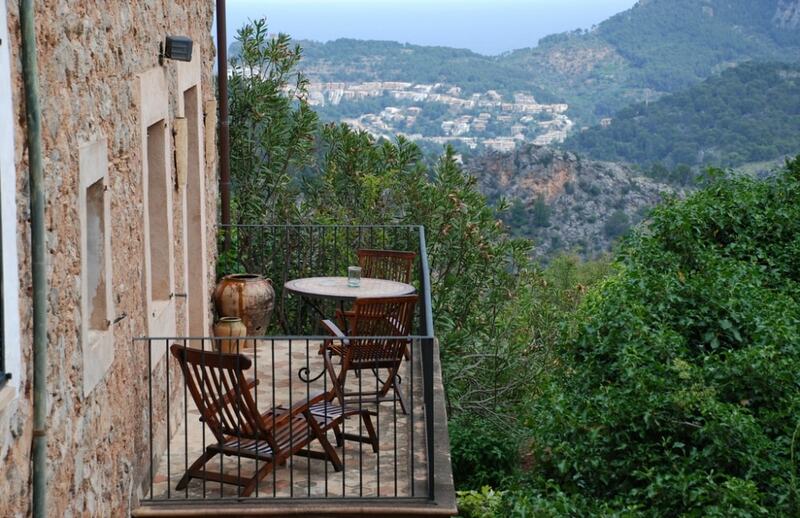 in Soller €3,078 0% properties#: 16 last change on: 19 Apr 2019 €3,078 per square meter. The most notable agencies on Soller Town property market listings the highest number of estates are Mallorca Dream Homes, XC Properties and Inmobiliaria Coll. Interestingly, the town became prosperous because of the valley’s abundant citrus groves. The 19th century, the area of Sóller was separated from the rest of the island by mountains, and the oranges were shipped to France from the west coast at Port de Sóller. Many inhabitants also decided to go to work in France, and those, who returned wealthy, built some beautiful estates that this town has today. 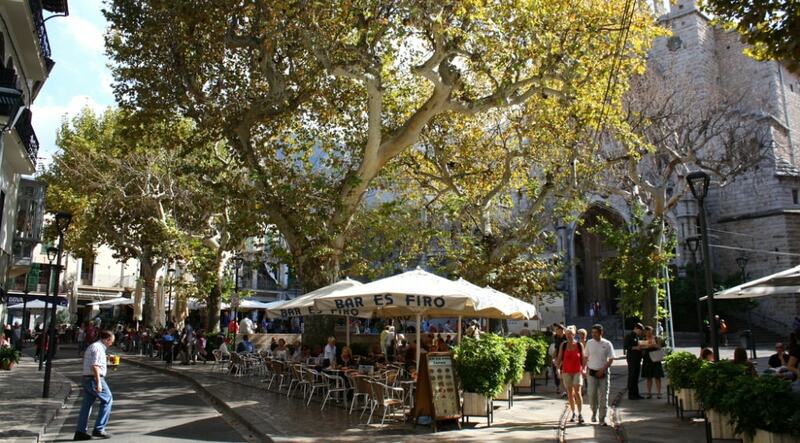 A walk around the old town of Sóller with narrow winding alleys can be an enticing experience. It is lined with historic buildings dating back to the 14th century and earlier, and a number of mansions of modernist or colonial style. The town’s architecture was strongly marked by Art Nouveau movement. No doubt it stands out, compared to others areas on Mallorca, in this respect. The beating heart of the town is its main Plaza Constitución. This picturesque square has plane trees and a fountain in its middle and is surrounded with plenty of cafés and restaurants. Many visitors who come here seem to do nothing more than sit outside and relax, soaking up the ambience and the sun with a coffee from one of the cafés. With a number of tapas bars, pastry shops, home-made almond ice-cream and fresh orange juice, there is only a small temptation to move on. The Plaza is dominated by the distinct landmark, the impressive Parish church of Sant Bartomeu. Originally, it was first built in the 13th century and the remarkable facade was created in 1904 by the Catalan architect Joan Rubió, the follower of Antoni Gaudí. The eastern side of this splendid square is flanked by the Banco de Sóller, a noteworthy Modernist building with Rubió’s defining ironwork. The sympathetically restored Art Nouveau building of Can Prunera with its beautiful facade, stairwell, murals and glassware is another architectural jewel. Newly opened, it houses a gallery with Modernist art collection including renowned artists such as Miró, Picasso, Kandinsky, Warhol, Matisse, Rusiñol, local artists Francesca Martí and Miquel Barceló. The 15th Century house “Casa de sa Lluna” is one of the oldest in the town and has a notable relief carving of a man in the moon on it. This building gave its name to the local pedestrianised shopping centre “Carrer de sa Lluna” with a variety of small shops that offer for local people and visitors anything from food and clothing to artisan craft and artistic products. Apart from this, shopping is not a major focus in Sóller. You won’t find many classy boutiques on its streets as it is all rather residential. However, there are some treasures, such as the square’s Plaza 13 Couture, an exclusive place selling designer clothing, decorative items and local art, with hand-painted furniture among them. The area becomes especially alive on Saturdays when the traditional market is held. It offers a great selection of local produce, including locally-sourced cheeses, meats, vegetables and antiques. Regardless of the many wonderful places to see, the town itself somewhat lacks the top-notch restaurants. Nevertheless, on the Plaza, you will find a number of casual eateries for a snack, and on some of the side streets, you can come across several quality spots. For example, Cafe Paris is the most decent for cafe con leche. The best restaurant in Sóller is an elegant Ca’n BoQueta serving modern Mallorcan cuisine. Located in a townhouse, it also has a nice courtyard for summer dining. The Ca’n Blau restaurant of the Gran Hotel Soller, housed in a magnificent building of the 19th century, also offers an unforgettable gastronomic experience. Here you will find a fusion of Mediterranean gourmet delicacies and a vast selection of fine cellar wines to suit any dish choice. A bit further away Sóller, Bens d’Avall serves sophisticated ”new Balearic cuisine” created by Benet Vicens, one of the foremost chefs on the island. Hanging on the edge of a cliff and set on a romantic terrace overlooking the most beautiful bay, the restaurant boasts spectacular sea views reaching towards Palma and unforgettable sunsets. 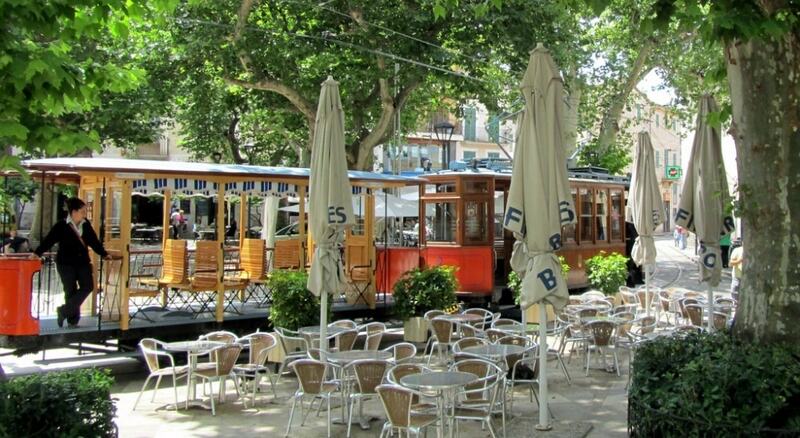 The town has a peculiar tramway that on its way passes through the Plaza. Notably, it is the only operating tram on the island and is locally known as the “Orange Express”. Not for carriages’ colour, but because it was used for transporting oranges and its route meanders through the orange groves to terminate at Puerto de Sóller. It was first opened in 1913 and some of its original 1913-built cars are still in service. 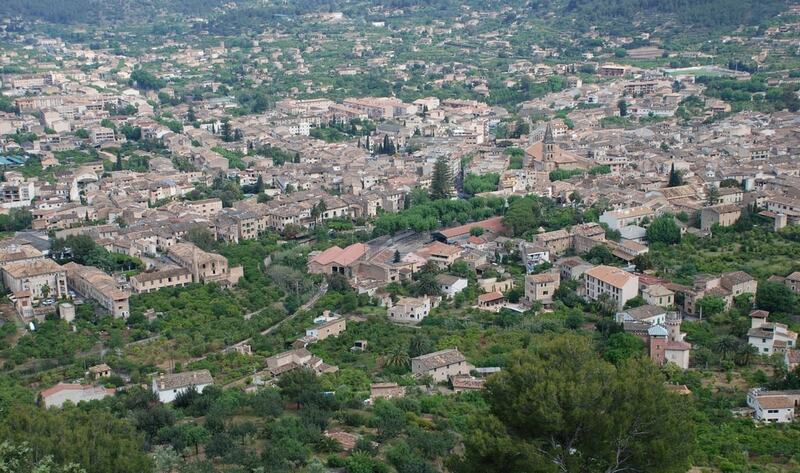 The proximity of Soller Town property market to the Mallorca’s capital is another factor that draws international property buyers to set up home here. On the road, there is a tunnel going through the mountain, and it takes around 30 minutes driving to get to the city of Palma. The road of Coll de Sóller with its 57 steep bends is also one of the windiest drives on the island, with stunning views from the top. 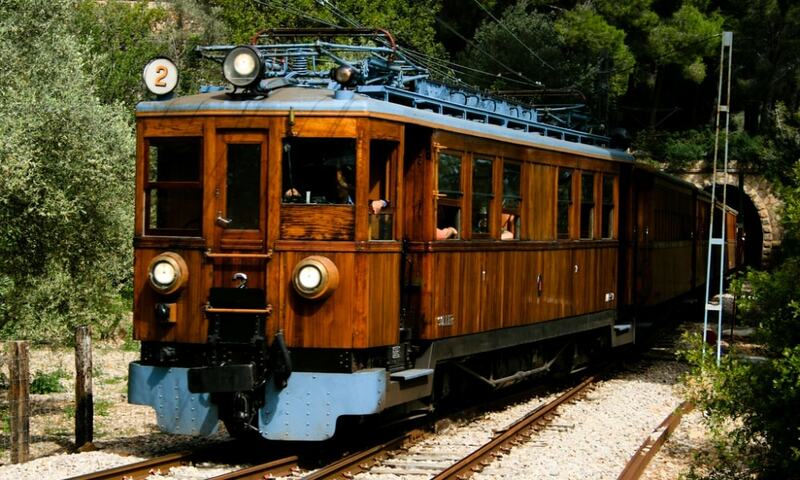 A journey on a vintage train of Ferrocarril de Sóller running between Palma to Soller is also a notable attraction. Both visitors and locals alike have been making this journey now for the past 90 years. Still, it runs through the 13 tunnels across the mountains and wonderfully scenic countryside with the passengers in its antique mahogany and brass carriages admiring breathtaking scenery en route. 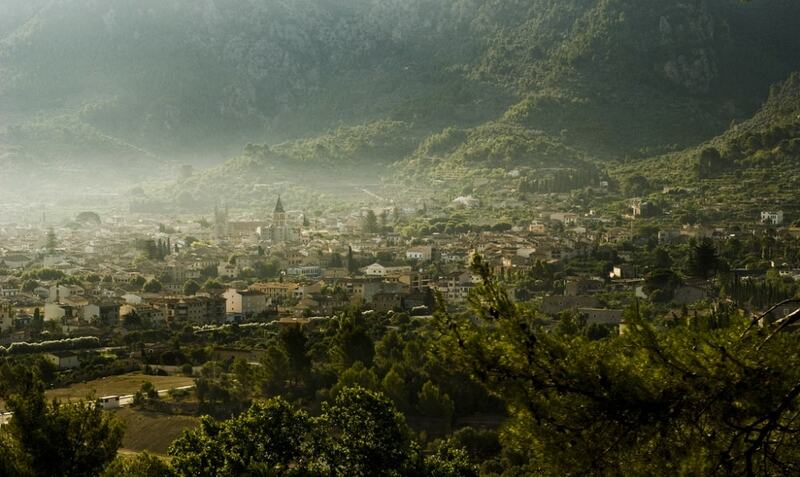 Many people come to Sóller to enjoy its great natural surroundings. Hiking is a major attraction for visitors and residents alike, who are spoiled for choice in the area when it comes to walking trails. You can choose from coastline routes to heading deep into the Serra Tramuntana. 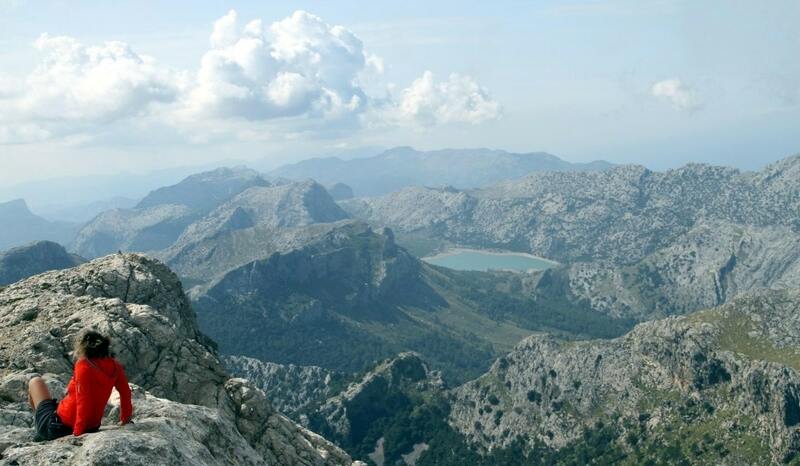 A must-do hiking route includes the one that goes from Sóller through the village of Biniaraix leading to the water reservoirs of Cúber Lake and Gorg Blau. The trail surrounded by the mountainous nature at the foothills of Puig Major and Puig de Massanella is amazing, as well as the lovely turquoise-colored lakes where goats are roaming around freely. Here, you can stop for a moment and just enjoy a moment of quietness, hearing only the wind and birds crying. Both mountain biking and road cycling are incredibly favored ways of exploring the mountains around Sóller. 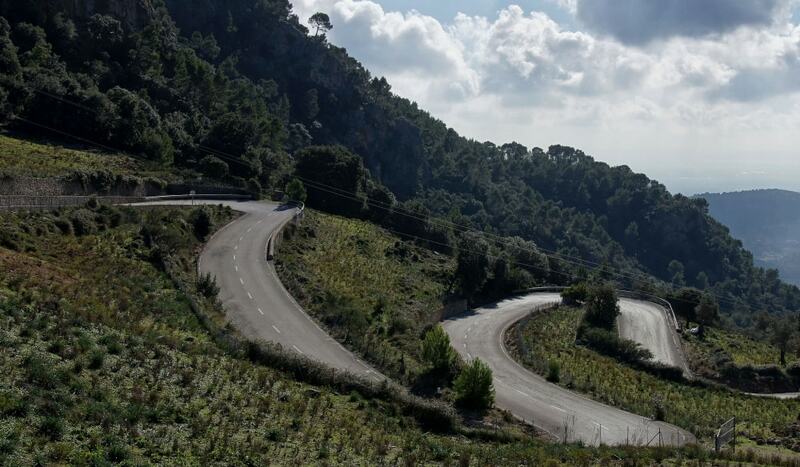 From the town up into the Tramuntana range, there are many roads that provide great challenges for the cycling enthusiasts, with plenty of curves, ascents and descents. The tunnel Coll de Sóller is also very famous with cyclists. Although they are not allowed to go through it but still seem to enjoy this thigh-busting climb. Tennis is also a popular activity in Sóller and there are superb public tennis courts at the Paddle & Tennis Club. Being located so close to the coast, you will find a heap of nautical activities to enjoy too. The beautiful marina of the nearby Port Sóller is popular with private yachts that anchor safely in the harbor. 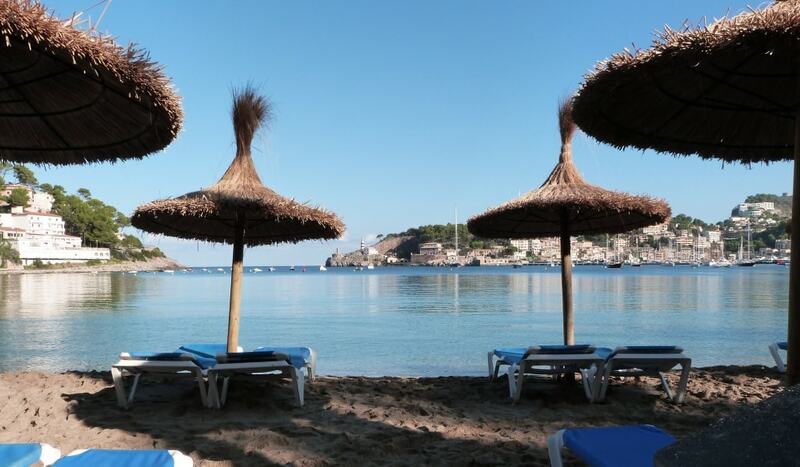 There are two beaches situated in Port de Sóller, just 3.8 kilometers away from the town. The best is considered the Platja d’en Repic beach (270 meter-long), popular with families for its golden sand and shallow water. The Platja des Traves is the closest to the port zone, with the tram line passing behind it. 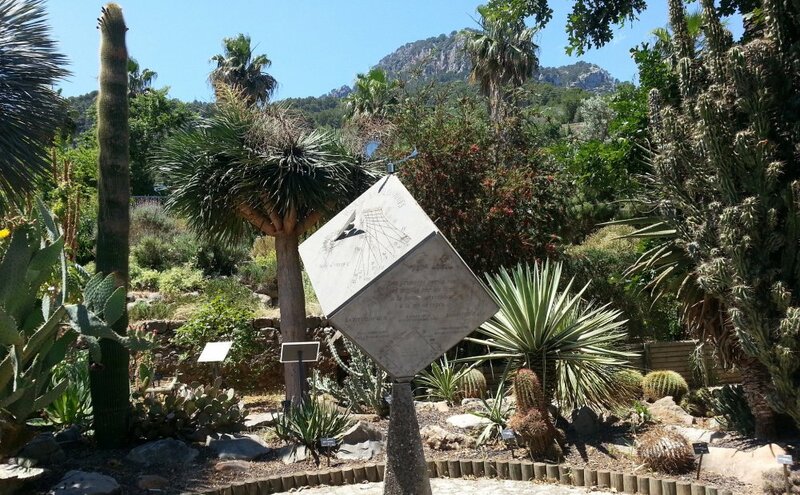 The renowned Sóller’s botanical garden or Jardí Botanic is found on the town’s outskirts. It features an excellent selection of plants from the Balearic and Canary Islands. 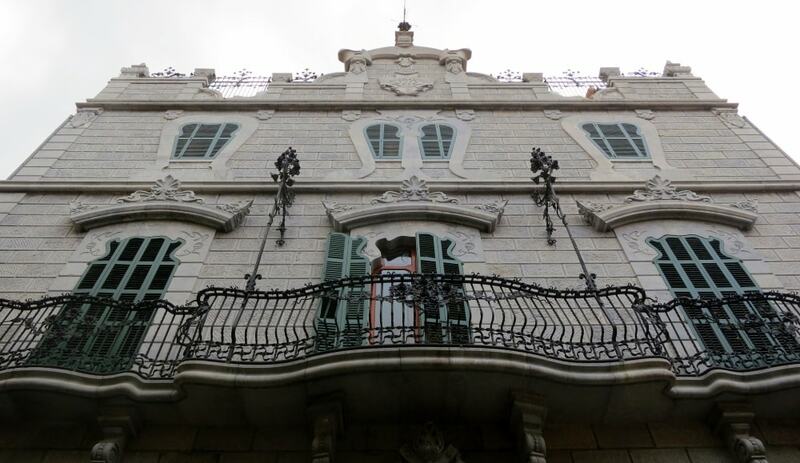 The early century mansion situated in the garden is a home to the Museum of Balearic Natural Sciences. 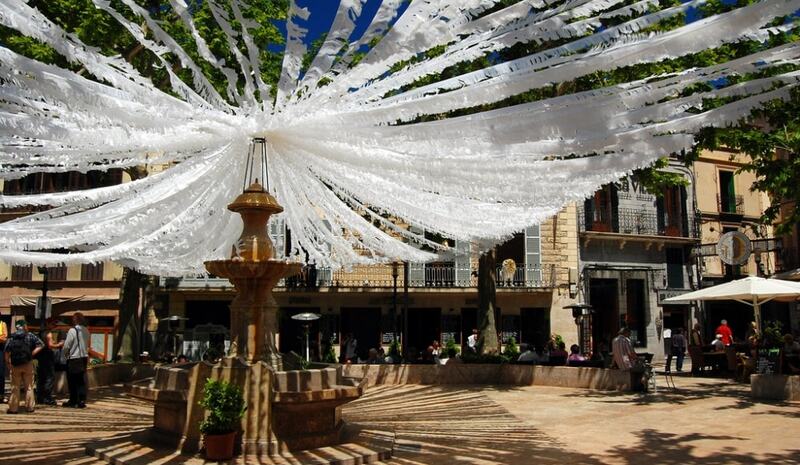 Sóller hosts a large number of various fairs and festivals throughout the year. The best and largest fiesta is the Moros y Cristianos Fira & Firo, taking place in the second week of May. It commemorates a 1561 battle between pirates and the local inhabitants. There is much of celebrating with concerts and dances and everyone dresses up as Moors in traditional costume. Also, there is a battle re-enactment on the beaches in Port de Sóller. 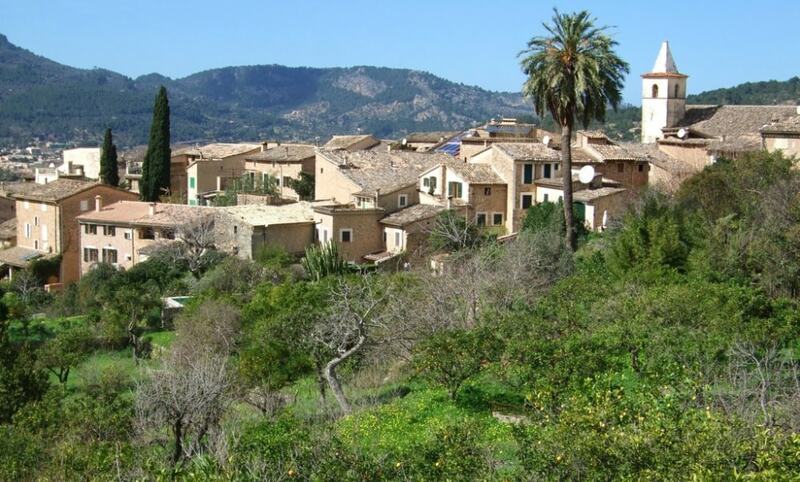 Mountains, sea, and a lovely fertile valley – no wonder that this is certainly one of Mallorca’s most sought-after residential areas.